My kids have split off and started a separate adventure while the rest of the group completes the Valley of the Brain Collectors and Starfall adventures. Both of which I think are too horrific (former) and adult themed (later) for them. So I have cracked out and updated Expedition to the Barrier Peaks for them. This is the session four of that “side” campaign. They will re-join the main group in adventure six – Divinity Drive. I realised before this adventure that I missed a golden opportunity to get my kids into space – an appropriate reward for having a spelljammer. So I did a bit of DM shenanigans and… got them into SPACE! They were immediacy attacked by space pirate mind flayer (the worst kind!) and this entire sessions was spent fighting it out on the miniatures board. Was fun for everyone. Its nice seeing the game “fresh” again through kids eyes it keeps my jaded eyes in check. Nothing fancy in this session in terms of monsters – everything was straight out of the MM. This is actually a re-write of an old Spelljammer mini adventure called The Brain Trade from SJA2: Skull & Crossbows. Mind Spiders – removed them, turned it into a mind flayer ship. Mind Flayer and umber hulks – straight from the 5e Monster Manual. Charmed Humans – Thugs from the 5e Monster Manual. The crew of the Dusklight (players ship) – an azer and scouts (from the Monster Manual) as well as some custom creatures like an Sunreaver golem (slightly modified Shield Guardian from the MM) and deformed androids. When all the minis were setup I picked up the map and physically shook it to represent the shuddering of the two ships as they smashed together. Any figure that was not on a ship hex after the shake was dead. I then stole the idea of escalation die from 13th Age and used it here. I flicked a fist sized d6 over every round and on every even numbered round I would pickup the map and physically shake it again – you fall you die – but you get a save this time. This put the fire under my kids to beat the baddies post-haste! Using a spelljammer Heidt and Rikku have located the orbiting Avenger and head toward it. Unfortunately a spelljamming Dominion of the Black vessel has also discovered it. Homing in on Xallitharid psionic distress call. Spotting the approaching heroes the Dominion Lancer attacks. As the tentacles jab into our ship, both jammers shudder, and one umber hulk, two charmed humans, and one of our crewmen plummet to the earth below. Deathtrap falls off, but he soon starts flying back to us thanks to his rocket powered body. Two old dazed men (“Grandpa 1 and Granpa 2) are flung back to the Illithid ship and the mindflayer is knocked prone. One of our crew gets knocked prone and almost falls off. One of the umber hulks slam one of our crew, and he goes flying out into space. The other one can’t seem to get through the horde of humans to our crew. 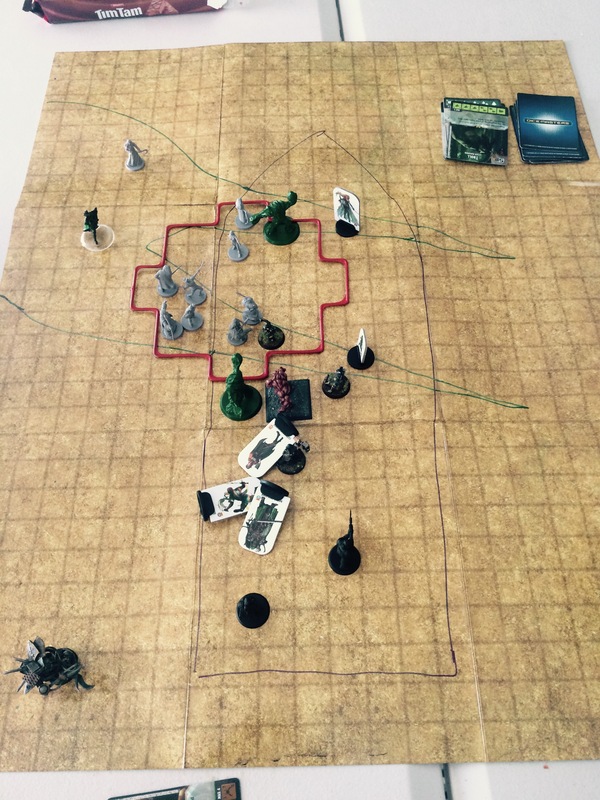 The two deformed androids (DM’s Note: Absconded from the foundry in Iadenveigh) go to the umber hulk that killed a crewmember and they start spearing him. Eight of the mind-controlled humans hit the two androids with their weapons, but the two old men are hobbling back onto our ship. The Azer, Bomber, walks next to the androids and swings his hammer at the umber hulk. Our crewmembers all try to attack, but pathetically miss. Hiedt aims a grenade on the pack of humans, and let’s loose the thunder bomb (DM’s note: The red template on the attached picture shows this point in the battle). Most of the humans look very hurt, and shocked. I pull out my pistols and shoot the umber hulk. Hiedt tells Deathtrap to fly towards the waiting mindflayer. My Sunreaver stomps up to the same umber hulk and punches it. The umber hulk goes floating into space. The mindflayer gets up, and he looks like he’s getting ready for a blast. But, he puts down his hands again, and looks as if he’s decided not to blast us after all (DM’s note: Too many of his own crew in the way). The ships shudder again and a few humans fall off. The mindflayer in knocked prone again. The crewmember that is on the edge, which is an acrobat named Greg, falls off. But somehow, he bounces against the side of the ship, backflips on the very close Deathtrap’s chest, and lands onboard again! He pulls out his crossbow, and aims it at the mindflayer, and even when lots of other things are blocking his path, he manages a critical on the flayer! (DM’s note: When the battle started none of the crew had names, but the end, the survivors had all earned names based on what they did during the battle. One of the beauties of D&D is how a setup idea+dice = story. Its storytelling from whole-cloth). The other crewmembers are shooting at the only umber hulk. Hiedt takes another bomb out of his bag and chucks it at the rapidly decreasing group of dazed humans. The bomb explodes, and all the dazed humans, except for the old men, go flying out of the ship. A skinny dazed human with a rusty sword replaces the umber hulk in front of the Sunreaver. The Sunreaver lifts his arms, and punches the life out of the skinny ninny. Deathtrap reaches the mindflayer, and swipes his claws at him. The mindflayer lets out an angry yell. He gets up, and shoots a cone of purple and pink waves, which Hiedt calls a Mind Blast. We don’t get hurt much, but one of our crewmen has been killed. Neither of the old men or Greg got shot. The Sunreaver, though a construct, is momentarily stunned from the sheer power of the blast. One deformed android misses, but the other one hits the mindflayer. Bomber walks up to the only umber hulk, and is about to give it some of his hammer, when the umber hulk opens all four eyes, and confuses everyone around him. He then hits Bomber with his mandibles. I shoot the umber hulk with my Divinity pistols. The two old men advance on Bomber. Deathtrap claws the mindflayer to death, as it screams in rage. The two humans that are left, who snap out of their charmed state once the mind flayer is dead, which are the old men, start thanking us and asking questions in the middle of battle. I shoot the last umber hulk, and we answer the old men’s questions. They say they will help us until we go back to Pangaea. We explore the Illithid ship and find 1 garnet necklace, jade earrings, a diamond bracelet, a heavy gold chain, and a platinum tiara studded with moonstones. We also find three captured elves – Darla Leafsong, Talis and Vray Mornstar. Two are twins and the other is a fighter-mage. They will all join us. We also find a black case with spikes (a lifejammer). We open it and find a female elf lady inside. She comes out and thanks us for rescuing her. Her name is Elowynn Silvermoon. She used to be the captain of another ship, until the mindflayers captured her and her surviving crew, the three elves, and brought them here. She was trapped inside that casing to use as a power source. The Illithid ships are run by someone’s life, and they just put Elowynn in there. Elowynn said she would be happy to help us, and we go back to my ship.